Microsoft hasn’t used too many word to describe i, but there’s no denying that Metro is Redmond’s way of getting into the App Generation. Previous versions of Windows have thrown rudimentary desktop widgets and Gadgets at us with little regard for how useless they are. 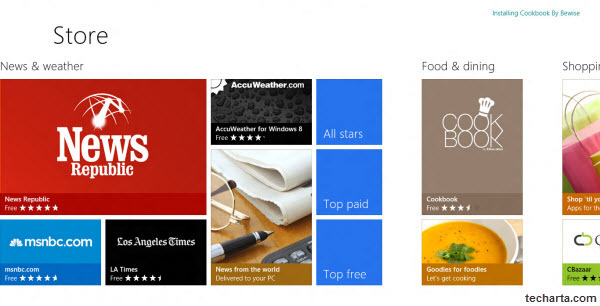 With Windows 8, the apps are the center of the experience. Live Tiles provide valuable info to give the design aesthetic real depth and purpose. 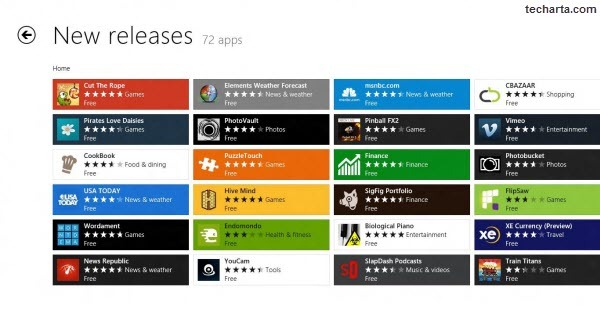 And the Windows Store gives us a glimpse of how serious Microsoft is about competing in the next generation of apps. For better or worse, Microsoft is considerably behind the pack. At the lead is Apple, which virtually defined app stores for all others to follow. Google followed (as always) with the Android Market, later expanded and given a coat of paint as the new Google Play. Competing for the Android user, Amazon has a different approach and as much media and selection as you’d expect from Bezos’ baby. Oh yeah, and there’s BlackBerry App World, which is pretty nice, if RIM devices still float your boat. The Windows Store is, at the moment, low on stock. We’re confident that this will change by and after the actual release, but it does mean that we can’t judge it on the amount and variety of apps on offer (hey BlackBerry, you lucked out for now). It’s probably just as well; even if Microsoft packed the store with various versions of every possible app category they could think of, Apple would still win. Presentation is an important consideration. It’s not all about looks, it is about visual usability. Unfortunately for Microsoft, Apple has a big lead there as well. With typical Apple aesthetics, the App Store manages to include both stylish design and a surprising amount of useful info. Undoubtedly, regular Metro users will be able to access Search and installed apps with second-nature gestures and clicks, but first-time and casual users are considerably better off with Apple. Windows Store also loses out to Google Play by a few points, although the two are quite similar in some ways, including the grid-based info-light home screen. Amazon’s app store looks just like every other Amazon page, which is very good for usable familiarity but nothing special in the design department. And poor BlackBerry simply looks like a slightly more photo-rich version of Google’s old Android Market, with considerably less helpful info on each detail page (no “users also installed” hints, too much space devoted to needless photos, etc.). Like a catalog with the pages rearranged at random. 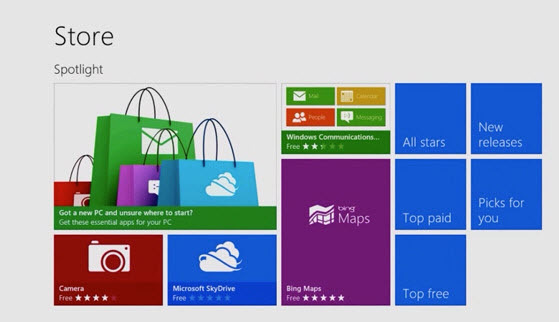 That’s what navigating through the individual app categories in the Windows Store is like. Although the images are very nice to look at, finding your way around, even with a Search function, tends to lead quickly to frustration. Endless scrolling, with no tiered category list, will only get more difficult as the number of apps, music, and video selections grows. At the opposite extreme, the anti-style Amazon is the easiest and most organized of the bunch, with a long Web 1.0-style list of categories on the left side of every page. The smartphone-based markets (Apple, Android, and BlackBerry) all depend on home screen portals and row- or column-based lists of apps under various helpful headings (Top Free, Top Paid, Most Popular, Newest, etc.). Windows 8 does shine when it comes to the individual app’s detail screen, which is very informative and visually appealing. Once again, Amazon’s text-dense detail page has plenty of information, without a hint of panache. And the smartphone app’s detail screens are nearly uniform aesthetically, with brief descriptions and a sprinkling of reviews, screenshots, and links to related apps. A slight edge goes to Android, for a bit more integration with the rest of the market, and Apple comes in second with a little extra visual style. Poor BlackBerry loses out, as we mentioned before, because the information in the detail view is decent enough, but you’re out of luck trying to get info on other related apps that might suit you better. App management on Windows 8 can be a baffling ordeal. You want to install an app? Fine, if it’s a Metro app and not desktop software. So why would desktop software even be an option at the Windows Store? Likewise, although it is nice to be able to distinguish between apps that have been purchased and those that have been installed, it would be even nicer to be able to uninstall them in the same place. You might also like to list them and uninstall them from the “Unistall or Change” dialog in the desktop side, but Metro apps aren’t even mentioned there. Unfortunately, we really couldn’t test upgrades, because everything is still in beta, so there may be bugs and other drawbacks in the process; we simply don’t know about them yet. Of course, this gets into Apples and oranges territory. On one hand, you can easily uninstall apps from your smartphone’s app list, or on the relevant app’s detail page. This applies to all app markets, even good ol’ BlackBerry. The loser here is Amazon, who tends to leave an extra step or two for the user (depending on the device itself; Kindle Fire is more manageable than compatible AT&T devices, for example). And to my knowledge, none of them support installing from a PC browser directly to a device, even if the device is connected directly via hardware or wireless. Also Read: What’s Going on with Windows 8? Windows 8 promises the extremely helpful ability to take an app out for a spin before installing it to Metro. This beats all of the smartphone app markets, which generally offer a free ad-supported version to install (and possibly uninstall) to see if you want to upgrade to the paid version. The only exception is Amazon, which offers the bonus of being able to try apps out right on your desktop PC before committing them to your device (very helpful for devices with limited storage space, such as the Kindle Fire). About the Author: This is a guest post from Greg Buckskin, a tech writer and social media manager for CableTV.com, an authorized Comcast dealer.